The study of highly migratory sea turtles requires coordinated efforts between researchers, conservationists, coastal community members and fishers. Biologists and fishers from Baja California uncover the migration of a Pacific Black Sea Turtle (Chelonia mydas agassizzi). The turtle was tagged by Equipo Tora Carey-ETC on January the 21st, 2017 in the North Pacific Beach of El Jobo, Guanacaste Costa Rica. Biologists tagged the turtle with a metal tag which is placed on the front flippers of the turtle. Taggs were provided by Centro Rescate de Especies Marinas Amenazadas (CREMA). 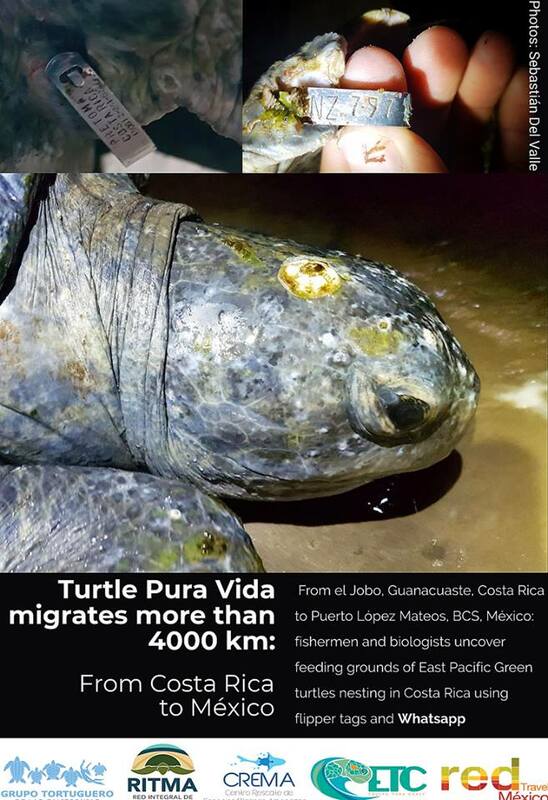 After its tagging, the turtle, named “PURA VIDA“ migrated at least 4000 km, from El Jobo, Costa Rica to Puerto López Mateos, Baja California, Mexico. Fishers and biologist found the turtle on March 21, 2019, while they were monitoring Pacific Black Sea Turtle’s Baja California Feeding Grounds. We would like to thank our friends from Grupo Tortuguero de las Californias and RED Travel Mexico for the fast communication and coordination, which allowed us this important record of the “PURA VIDA” migration.